It doesn’t need to be Halloween to enjoy this scary good Black Bean Avocado Soup. And don’t get me wrong… the cute avocado spider web is pretty tricky, but all the vegetables hiding in this soup are the real TRICK! Makes 4-5 cups soup; two entree servings. 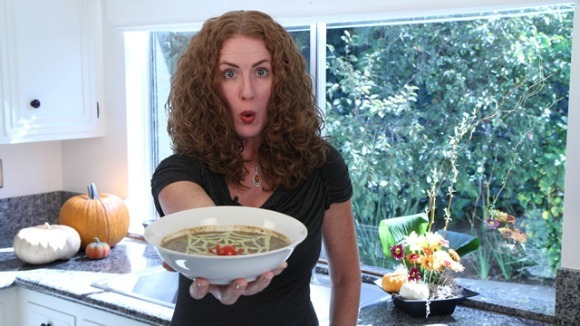 For added instruction and entertainment, watch the TRICK AND TREAT Black Bean Avocado Soup Video. 1) Peel and quarter one of the California Avocados. 2) Place quarters in blender. 3) Season with salt and your other favorite guacamole mix-ins, pureeing until creamy smooth. 4) Spoon creamy avocado into plastic bag for piping. Refrigerate until ready to use. 1) Peel and quarter the other California Avocado. Cut into bite-sized pieces. Set aside until ready to use. 2) Separate 1/3 cup whole beans from can of black beans (liquid reserved). 3) Saute carrot, onion, red bell pepper and celery in 1 tablespoon olive oil over medium heat until softened (5 minutes). Season with salt and black pepper. 4) Add garlic, jalapeno, Canadian bacon and potatoes. Stir in chicken broth and salsa. 5) Bring to a boil, reduce heat to low. Cover and simmer until tender (15-20 minutes). 6) Add spinach and cilantro. Stir and simmer uncovered until spinach begins to wilt (5 minutes). 7) Add black beans with liquid to the broth mixture. Simmer an additional 5 minutes. 8) Carefully transfer mixture to blender. Puree until smooth. Return puree to pot. 9) Stir in reserved black beans, chopped tomato, chopped California Avocado and cumin. Salt and pepper to taste. 10) Serve piping hot. Garnish with California Avocado spider web. 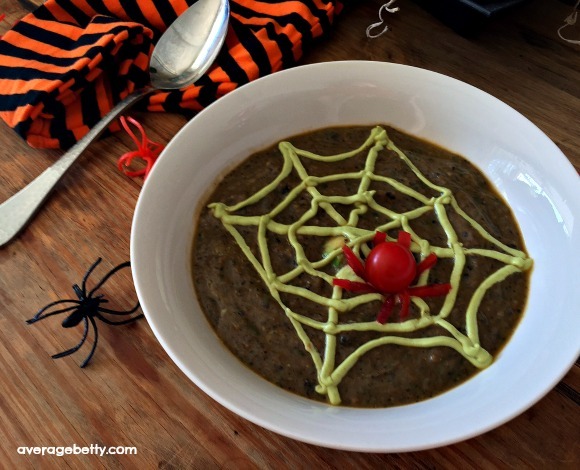 For added instruction on the spider web, watch the TRICK AND TREAT Black Bean Avocado Soup Video. For added instruction and entertainment, watch the TRICK AND TREAT Black Bean Avocado Soup Video. The Average Betty Test Kitchen developed this recipe and produced this video on behalf of the California Avocado Commission. Nutrient dense California Avocados provide nearly 20 essential nutrients, including fiber, potassium, Vitamin E, B-vitamins and folic acid and enable the body to absorb more fat-soluble nutrients. For more great recipes using California Avocados, check out the California Avocado Commission Commission Website.